In this post, I will present the 26 players of the Ghana B national football team for the 2013 WAFU Nations Cup. The picture is of Asiedu Attobrah and was found on ghanasoccernet.com. * Foli Adade is an excellent shot-stopper and the first choice goalkeeper at Medeama SC. According to the Confederation of African Football, Adade is born 12.05.1991. According to Ghana Football Association, Adade is born 10.12.1992. * Francis Adjei has been one of the revelations of the new season. The tricky winger of AshantiGold SC, picked up from amateur football, has scored two goals during the GLO Premier League 2013-2014. * Stephen Adams is the veteran goalkeeper of Aduana Stars FC, widely regarded as one of the best goalkeepers in the GLO Premier League. Adams is known for his consistency and commanding displays. * Centre-back Kwabena Adusei is strong as a bull and is well-known for his thunderbolt free-kicks. So far this season, Adusei has played 10 matches (1 goal) for Asante Kotoko FC. * Samuel Abeiku Ainooson is the defensive partner of Kwabena Adusei, having played 11 matches (0 goals) after his transfer from New Edubiase United FC. Ainooson is a quality defender with a bright future in the beautiful game. * Michael Akuffo is a workaholic midfielder, known for ball-winning ability, clever passing, counter-attacking moves and physical strenght. Akuffo has played 11 matches (2 goals) this season. * After a couple of seasons as second-choice at Asante Kotoko FC, veteran Isaac Amoako has retained the number one shirt. Amoako has played 11 of 12 matches this season, impressing with match-winning saves. * Theophilus Anobaah is a skilful winger who loves to dribble and make attacking runs into the box. After several great seasons for AshantiGold SC and Medeama SC, Anobaah should be good enough for bigger leagues. Anobaah has scored one goal this season. * Emmanuel Asante is a highly-regarded left-back at Bechem United FC, presented in this YouTube-video: www.youtube.com/watch?v=ZUcUE_shOMc. According to the video, Asante is born 02.05.1995. * Mohammed Abdul Basit is team captain and the midfield general of Berekum Chelsea FC. Basit is a big, strong goalscoring midfielder with plenty of experience from the local league. * Powerful striker Richard Gadze was one of last season’s revelations. This season, Gadze has scored only once for Ebusua Dwarfs. * Latif Mohammed is a quality player, often found on the left-wing of AshantiGold SC. Mohammed covers a lot of ground due to his impressive work-rate. Mohammed has excellent ball-control and is dangerous in front of goal. * Sulley Mohammed is one of the most interesting strikers in the GLO Premier League. Mohammed is a strong, fast and skilful player with a bright future. At the time of writing, Mohammed has scored five goals during the GLO Premier League 2013-2014. * Abubakar Moro is a defensive midfielder, stabilizing the midfield with his ball-winning abilities. Moro is a tireless worker and one of the first names on the team-sheet of Hearts of Oak SC. * Few players in the GLO Premier League can match the left-foot of Francis Morton, the left-back or left-winger of Ebusua Dwarfs. Morton is known for his thunderbolt shots and precise deliveries from the left. He is also somewhat of an expert from set-pieces and always willing to join the attack. According to unconfirmed sources, Morton is born 05.11.1992. * Petit winger Richard Mpong is known for excellent dribbling skills, pace and pin-point crosses. When Mpong is in form, few defenders can stop him. Mpong has played 11 matches (1 goal) for Asante Kotoko FC this season. * Alfred Nelson is a commanding centre-back and the team captain of Liberty Professionals FC. * Jordan Opoku is arguably the finest midfielder in the GLO Premier League. Opoku is a creative, attacking-minded midfielder with silky passes and an excellent understanding of the game. Opoku has played 12 matches ( 1 goal) this season. * Jackson Owusu is a hard-working holding midfielder who shields his defenders effectively. Owusu is also comfortable in a central defensive role, and is a key player at Berekum Chelsea FC. * Edmond Owusu-Ansah is a classy and experienced midfielder, partly responsible for the fine form of Heart of Lions FC. * Godfred Saka is arguably the finest right-back in the GLO Premier League. Saka is strong in the tackle, excellent going forward and is an expert from set-pieces, explaining his impressive goalscoring rate for a defender. At the time of writing, Saka has scored three penalty goals after 12 rounds of the GLO Premier League 2013-2014. * Nuru Suley is a key defender at Hearts of Oak SC, having played 11 of 12 matches this season. Suley is strong in the air and a hard tackler. * Joshua Tijani is a dependable centre-back, known for his power and strenght. At AshantiGold SC, Tijani faces tough competition from Awudu Nafiu and Lawrence Lartey, and he will sometimes be found at right-back. 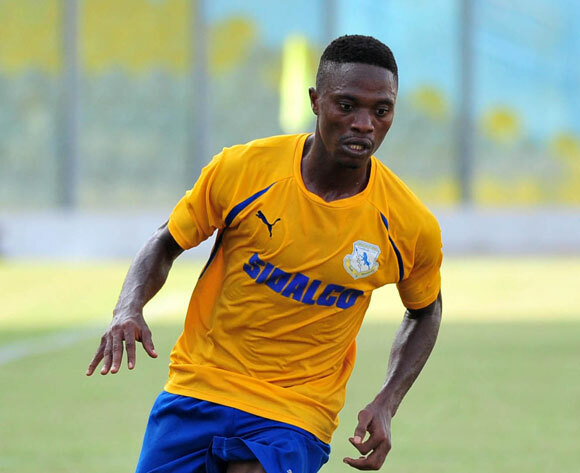 * Mohammed Yahaya is a versatile player, originally a midfielder but often played up-front at Asante Kotoko FC. Yahaya has scored 2 goals in 11 matches this season. Yahaya is a skilful player with great physical strenght and powerful shots. * Personally, I think it is wonderful that experienced players like Samuel Yeboah returns to Ghanaian football. The pacy attacker, who has scored 50 goals in the Israeli top division, is a full international player for Ghana who has became a key player at Heart of Lions FC. Yeboah has scored four goals so far this season.